Chris Woakes has eased concerns over his fitness as he prepares to return to the England side for the third ODI against Windies. All-rounder Woakes has been nursing a knee complaint and sat out Friday’s second fixture in Barbados, which the Windies won by 26 runs to level the five-match series after England tumbled from 228-4 to 263 all out. The Warwickshire seamer should regain his place on Monday – Tom Curran the man most likely to make way – with Woakes saying he is “fine” ahead of a busy summer that includes a home World Cup and Ashes series. “People are going to ask questions when you get rested from a game and you’ve not played much cricket but in my own mind I’m fine,” said Woakes, who missed England’s Test series against Windies with the tendon issue. “By no means do I feel I’m coming to the end. It’s something I’ve had to manage for the past six, seven, eight years and not something I’m overly worried about. “A lot of people call it tendinopathy, tendonitis… it’s just a dodgy knee from too much bowling. But it’s not a concern. It comes with the territory. “Of course it’s in the back of my mind but I’m keeping it in the right place, keeping the rest of my body in good condition and doing everything I can to stay fit. 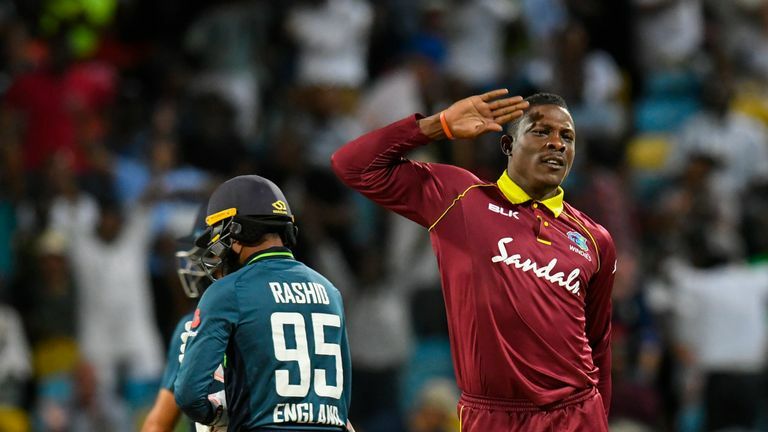 England were undone by saluting seamer Sheldon Cottrell on Friday night – the left-arm quick, whose zany celebrations stem from him being a soldier in the Jamaica Defence Force, bagged 5-46 as Eoin Morgan’s men failed to chase down Windies’ Shemron Hetmyer-inspired 289-6. Hetmyer had scored 104 not out from 83 deliveries at Kensington Oval, his fourth ODI century. Cottrell dispatched England openers Jonny Bairstow and Jason Roy cheaply before returning to prise the wicket of Morgan for 70 and then remove Moeen Ali and Adil Rashid as the duo threatened to take the tourists close to their target. Jason Holder’s three quick scalps – the Windies skipper ousting Ben Stokes (79), Jos Buttler and Tom Curran – also proved pivotal as England went on to lose their last six wickets for 35 runs. “In a way, it’s a kick in the backside,” Morgan said about the defeat during an interview with Sky Sports Cricket. “We don’t turn up to the ground expecting to win every game – there is a lot of hard work that goes into every result we produce. Darren Bravo will win his 100th ODI cap for Windies, while swashbuckling opener Chris Gayle will be looking to back up his scores of 135 and 50 in the opening two ODIs in Barbados. On Gayle, Woakes said: “Up front he hasn’t got away from us, we’ve got a lot of dot balls on him – but we’ve played games against him where he’s gone from ball one. You need to expect the unexpected with him. “He can easily come out and try and hit you for six from the first few balls. Dot balls are great but at the same time we want to be getting him out. Watch the third ODI between Windies and England, in Grenada, live on Sky Sports Cricket from 1pm on Monday! You can also follow over-by-over commentary and in-play clips on our rolling blog on skysports.com and the Sky Sports app.